Aw yeah. Green stuff is starting to come up. 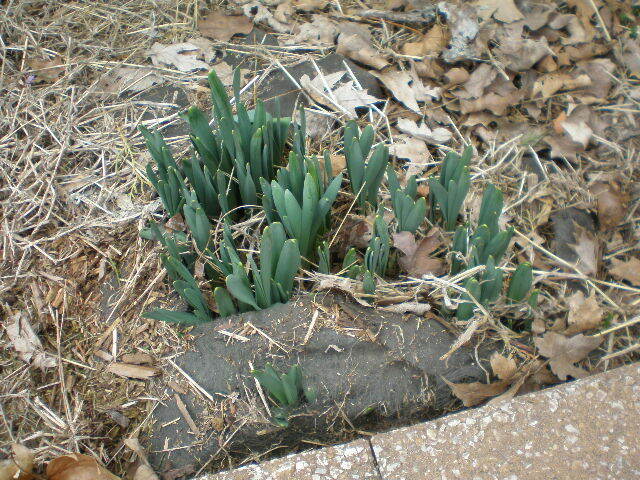 These are daffodils in our front flower bed. In the picture above are all my supplies. The black blob on the left is my tray. It’s just a plastic tray I picked up at the hardware store the year I started gardening. In the back are seed starting mixes. The left one is Ferry Morse left over from last year (which was left over from 2008). The right one is an organic Jiffy mix that Benzo bought at Home Depot the other day, because we knew we would run out of the other one. Seed starting mix will run you $3-4 for a big bag that should last a couple seasons (depending on how many seeds you start). In the middle is my big bowl and my yogurt containers, which have been repurposed into seed containers. Below them is a roll of masking tape and a sharpie. On the right is a Victoria’s Secret bag which holds all my seeds. I have no idea why I use a VS bag, but I’ve been using the same one since last year. First decide what seeds you want to start. 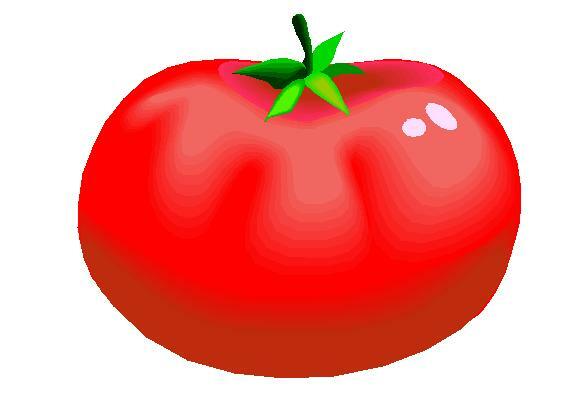 Tomatoes and peppers are the typical plants that are started indoors. Some herbs can be started indoors and also some flowers. Read the back of the seed packet to determine whether to start your seeds indoors or not. Some plants do not like to be transplanted so you should direct sow them straight into the garden. Some plants do not see much benefit from being started indoors so you might as well just wait and plant them straight into the garden, instead of messing with caring for them indoors. I always direct sow corn, zucchini, watermelon, green beans, lettuce, spinach, peas, onions, turnips, carrots, winter squash, and pumpkin. Today I plan to start tomatoes, bell peppers, hot peppers and brussel sprouts. For each plant you want to start, you’ll need a seed container. 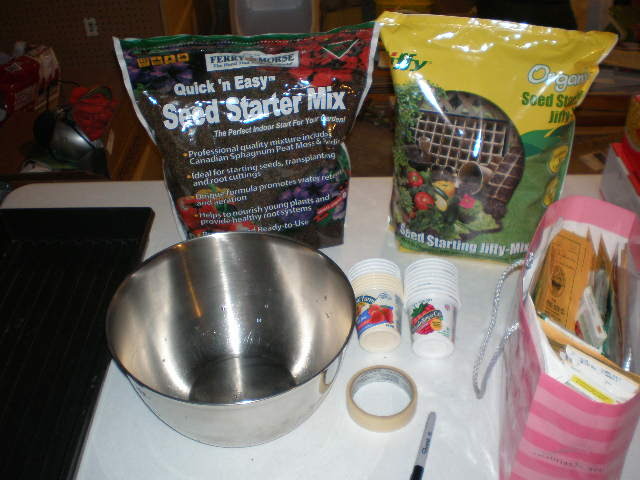 Fill your big bowl with seed starting mix. Use as much as you think you’ll need to fill up your containers. You can always get more out later if you run out, so err on the side of not enough. Add water to the bowl and start mixing it up. I used my hands which is why I don’t have any pictures of this part. Once the seed mix is nice and damp, start filling up your containers, almost to the top. I called Benzo in the garage to take this picture and to open doors for me so I could rinse my hands off in the kitchen without getting dirt everywhere (so you might want to just do this in your kitchen instead of the garage like I did). Now get one of your packets of seeds and pour some out into your palm. Put 2-3 seeds in each pot. Put the rest of the seeds back in the packet and fold over the top. You can use these next year. Those tiny little white things in the middle are bell pepper seeds. It’s amazing that it will grow into a big plant that gives me food! After you’re done with each packet, or type of seed, make sure to label your containers. 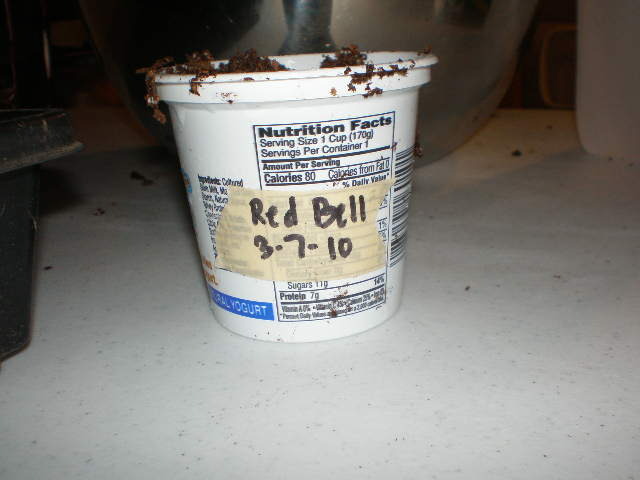 I use masking tape and a sharpie to label my containers. This is very important so you can remember what your plants are! Once you’ve got some experience gardening you can start to tell the difference between plants. I can tell the difference between a tomato plant and a pepper plant. But I can’t tell the difference between the varieties of tomato plants or pepper plants, especially as seedlings. 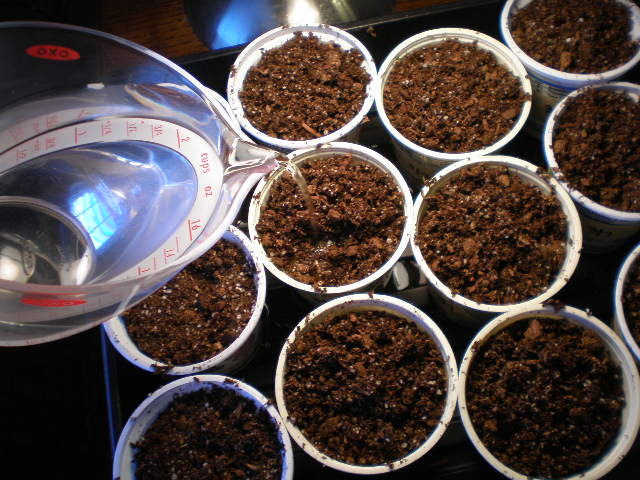 Once all your seeds are in the pots and labeled, cover them up with a little bit of dirt. The bigger the seed, the deeper it should be. But it should only be as deep as twice the size the seed. Some seeds are so tiny, they only get a light dusting of dirt over the top. Now you need a place in your house to keep the seeds for the next 6-8 weeks. Since I have cats, I have to keep my seeds behind a closed door. They need to be in a place where they can get a lot of natural light and be kept warm. This is very important. 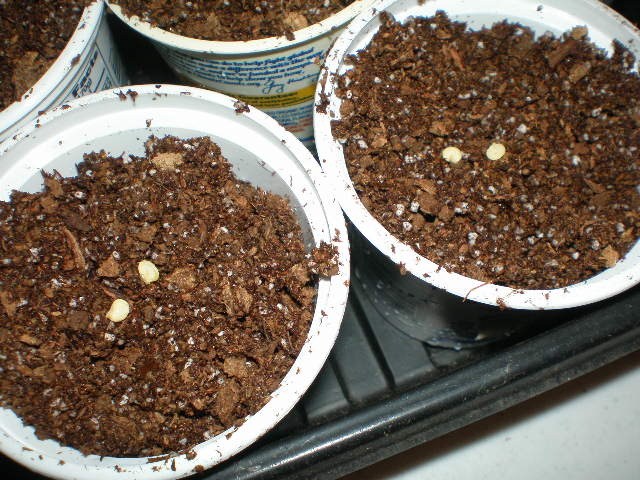 Seeds will not germinate if they are not warm enough, or they will take a lot longer to germinate. I have the seeds on the edge of a desk in a spare bedroom, right by the window. I have an old desk lamp next to the seeds, bent down so the light is very close to them. The trick is to get an old halogen bulb instead of the new CFL bulbs. The old bulbs emit a lot of heat which keeps the seeds warm. I rotate the seeds around in the tray every day or so. That way they all get a chance to be under the heat. Now give your seeds a drink of water. Some water should run out the bottom of the containers (that’s why you have a tray!). Now you wait. It’s kind of anticlimactic really. 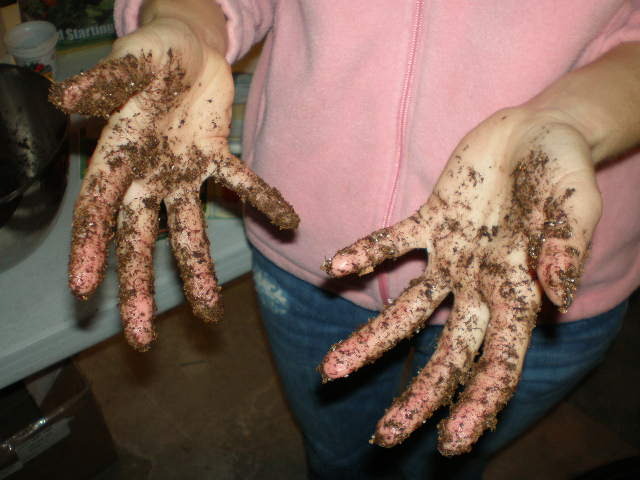 You do all this work to get them planted and you end up with pots of dirt. BUT in a week, maybe sooner if you’re lucky, you will start to see sprouts! Check on your seeds a couple times a day to make sure the tops are damp. Give them water any time they look dry. The heat from the lamp will dry them out so I sometimes water them twice a day. If using the lamp method, make sure to rotate the seeds so they all get a chance under the heat (or move the lamp around). This morning I started 3 pots of green/red bell peppers, 3 pots of other colored bell peppers, 3 pots of roma tomatoes, 3 pots of brussel sprouts, and 2 pots of jalapenos. I might do some more this afternoon, but right now the sun is shining and the road is beckoning me to run on it, so I’m heading out for a 6 miler. 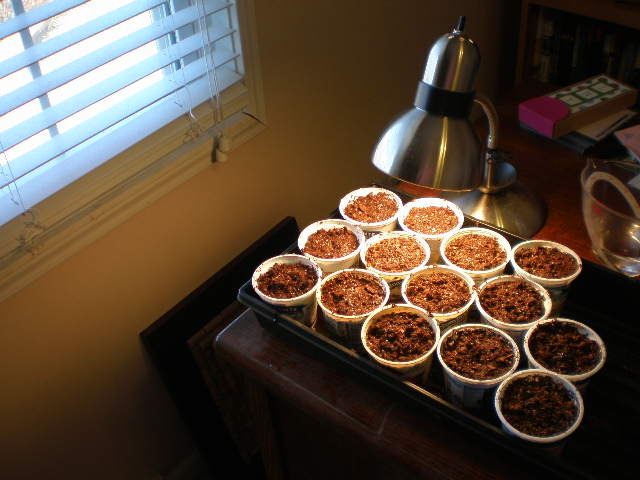 If you have any other seed starting tips and tricks please share them in the comments. I’m always looking for new ideas!